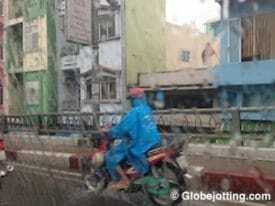 Rainy season in Saigon: Heavy rain thins out traffic but many people put on ponchos and keep going. But I need to go. I need to get out. It’s 2:30 p.m. on what was supposed to be my first day off in a couple of weeks. It hasn’t been a full day off. My morning has been hijacked by unexpected tasks. I’m still determined to have a few free hours, and I want to stick to my original plan. My original plan has been to head to Bui Vien Street, at the heart of Saigon’s backpacker district, where there’s always something ridiculous to observe. It’s an hour by bus, a half-hour by taxi, from where I live in District 7. It’s the street I’m writing my book about. I haven’t touched my manuscript in months. I don’t plan to on my afternoon off either, but I’m hoping a few hours of people-watching will get me back in the writing mood for later. So I grab my falling-apart umbrella, and put on the pair of flip-flops that are my usual footwear for weather like this. I’m out the door toward the taxi stand. Motorbikes are the vehicle of choice in Saigon. When it rains, people put on ponchos and keep riding. If it’s coming down heavily enough, however, traffic lightens – so, thanks to the weather, our journey to District 1 is unusually fast. My fare is a couple of dollars less than normal. When I arrive, it’s still raining hard, but the streets, which can flow with several inches of water in weather like this, aren’t as flooded as I worried they might be. I grab a late lunch at a sidewalk table. An awning deflects shotglass-worthy raindrops. A thin mist wafts in from the fringes but I don’t mind. It’s better than sitting inside where I can’t observe the non-stop carnival that is Bui Vien Street. Today, however, the road is quiet. There’s not much happening. I’m munching my lunch, and taking deep breaths to soothe my cluttered brain, when I notice, down the street, something is wrong. Traffic is stopped in both directions – three backed-up taxis one way, several dozen motorbikes in the other direction. There has been an accident. Motorbike fender-benders are common here. Often, the parties involved exchange quick, surly glances, then shrug and drive on. But this looks serious. From my table, I can see several people hunched over in the road, trying to help. Lots more people on their idoling bikes are looking concerned. I can’t see who has fallen. I can’t tell how bad it is. I wonder if I should get up and help. I have first-aid training. But also, the sight of blood makes me nauseous. I’m not sure I want to see this. As I mull over whether or not to get involved, I notice something else. The biker is unscathed, but something more serious has happened: Two cases of Tiger Beer have come un-bungeed from the back of a bike. Bottles are strewn everywhere in the road. Oh, the humanity! Shopkeepers and passers-by are helping to clear the mess. They are tenderly placing the unbroken bottles back in their cases, and sweeping up the broken ones so it’s safe to drive. The answer doesn’t matter. I’m not here to judge. I came to Bui Vien Street because even on quiet days, the road is always a source of stories and surprises. Thanks to a worn-out bungee cord, it has given me what I came for. Rainy season on Bui Vien Street can be an adventure. Here’s a short video I shot a couple of years ago during heavier flooding.